Since its founding in 1947, Pakistan has fought four inconclusive wars with India, and tensions heated up again last week when five Indian soldiers were ambushed and massacred in the disputed Kashmir region between the two countries. The government in Pakistan has denied any involvement in the attack, but according to reports, Indian cannons shelled Pakistani positions in retaliation, and the Indian government has hinted greater reprisals may be in store. India and Pakistan both claim ownership of the area, and according to U.S. government satellite data, it seems India may be assembling an army of nearly half a million men to settle the issue once and for all. 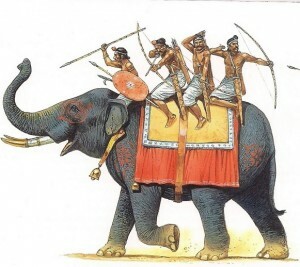 War elephants and their handlers have been recalled from the frontiers, and blacksmiths from Jaipur to Bangalore have been drafted to ensure Indian muskets and bombards are in top fighting condition. The regime in Pakistan is also reportedly putting its country on a war footing, and its famed horse archers and cavalry formations are poised to sweep into the rich regions of northern India as soon as hostilities commence. Neighboring countries are also beginning preparations for the conflict, and in addition to stepping up their own border defenses, many are also preparing for the inevitable economic opportunities. Slave markets in nearby Burma and Iran have already started building larger holding pens for the inevitable flood of captives, and if you’re in the market for a domestic servant, concubine or laborer, there may never be a better time to buy than in the next few months.